Show off your ear piercings with our amazing new range of ear piercing bars. These bars are brand new and come in a great choice of designs, from glam jewels to screaming skulls. 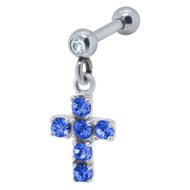 You can wear these ear piercing bars in ear lobe piercings, tragus piercings or helix piercings. They are small but beautifully made, with great detail and a high quality finish that will last a lifetime. 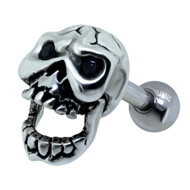 All our ear piercing bars are made from high quality surgical steel. They are finely finished and hand checked to ensure that even the smallest piece of jewellery is the best possible quality. These bars are non-irritating and very comfortable to wear. All six come in 1.2mm and the bars are 6mm long. This makes them ideal for the small spaces in your ear and gives a more petite look. Whether you choose a glam jewelled cross or a simple Celtic twist, these ear piercing bars are a wonderful way to update your look. 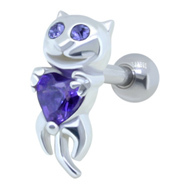 This entry was posted in Ear Studs and Earrings, Surgical Steel Body Jewellery and tagged ear piercing, Ear Piercing Bars, Ear Piercing Jewellery, Ear Piercing Studs, Ear Piercings on January 22, 2014 by Piercing Guru.